Double Your Impact for Biblical Truth! Simply put, we couldn’t do any of this without your faithful prayers and financial support. And now, through the generosity of some ministry friends, the impact of any gift you give will be doubled through our $375,000 Proclaim the Gospel Matching Challenge. Please stand with us and match this challenge established by these generous partners before December 31. To thank you for your generous donation to help us to continue to proclaim the Gospel of Jesus Christ, we have prepared a wonderful new resource—unlike anything we’ve done before. 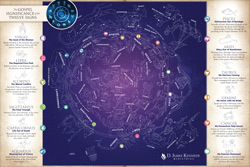 It is a beautiful poster-size (16” x 24” 2-sided) Gospel Planisphere of the heavens, which clearly and beautifully illustrates the story of the Gospel that God wrote in the skies at creation. Based on Dr. Kennedy’s Biblical research and knowledge, it shows how, contrary to pagan astrology, God placed the Zodiac in the heavens to proclaim the story of redemption. You will be amazed and astounded as you look at the 12 major constellations, along with a summary of the Gospel meaning of each, and a related Scripture reference. It gives no credence to horoscopes or other such corrupted studies of astrology, which Dr. Kennedy strongly repudiated. Rather, it shows how the starry skies do indeed reveal the glory of God and His salvation offered freely to mankind. 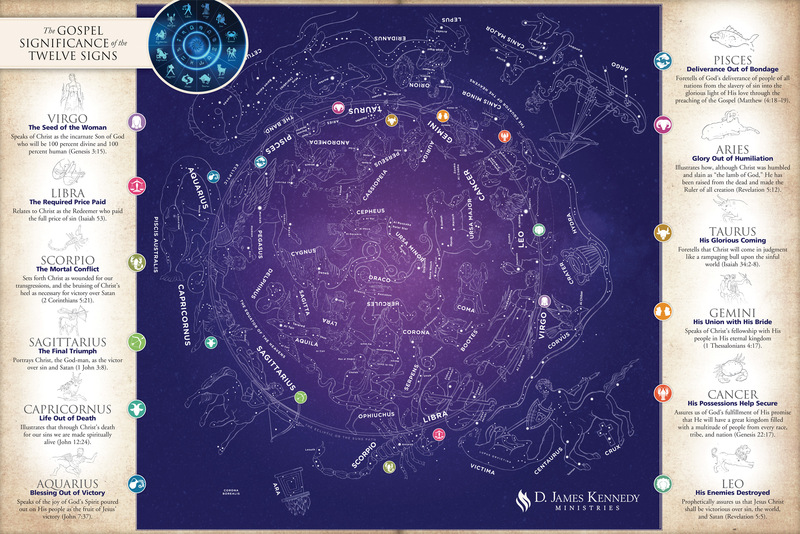 In addition to the Gospel Planisphere and The Real Meaning of the Zodiac book, we’d like to make available to you all 13 messages Dr. Kennedy preached in The Gospel in the Stars sermon series, featuring a full-length message on each sign of the zodiac. They are available on either CD or DVD for your donation of $100 or more. This series is one of our most-requested set of messages ever from Dr. Kennedy! So don’t miss it—and why not share it with a friend or loved one? It’s also a wonderful opportunity to double your impact as you help us proclaim the Gospel now and in the pivotal new year ahead! Request your ministry resources today.